The first ever RKP (reverse kingpin truck) was made 34 years ago by Randal. Every truck since then has copied off their design and as such, you can switch around hangers and baseplates, and still have a properly functioning truck. That being said, a lot of other trucks aren’t the same and have different dimensions; thicker pivots, different kingpin geometry etc. So not all are compatible. In today’s article, I’ll be exploring truck compatibility and talking about how you can mix and match certain baseplates and hangers. I’ll particularly be mentioning the 28* and 35* Randal trucks baseplates and how I’ve set them up on my board. Getting straight to the point, most of the Cast trucks in the market are Randal compatible. Paris, Paris Savants, Calibers, Gullwing chargers, Gullwing Reverse, Sabre etc. They can all use Randal baseplates and hangers interchangeably and even switch hangers and baseplates between themselves. Some Cast trucks like Ronin, Bear and Rogue trucks are not and can only really use their cast, forged or precision counterparts. Check out the truck compatibility table below. Click here to go onto the google docs version for a better view. * The table is not exhaustive and loads of other trucks not mentioned are compatible – eg. PNL trucks are Randal geometry compatible but are not shown as such. As you can see, lots of trucks are compatible and a lot of them are not. 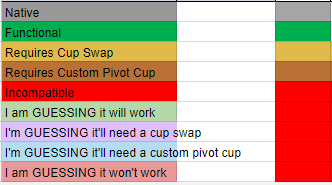 You can also see that certain trucks need you to swap the pivot cup for you to be able to mix an match. Why should you take advantage of Randal compatibility? If you like your cast trucks and want to try a lower angle baseplate in the back. You don’t have to buy precision trucks or change everything all together. Just buy a Randal baseplate or a compatible lower baseplate and there you go, you get to experiment with lower angles at an affordable price. You get to enjoy the benefits of a split angle setup and can go up to higher speeds and still be stable. You can interchange hangers, allowing you to experiment with narrower hangers, hangers with rake and even open or tighter bushing seats. On the same baseplates, you can have Paris hangers and have a setup that is divey turns great and is relatively responsive. You can then switch to Caliber hangers for a more linear feel with direct steering or even to Gullwing reverse hangers for another different feel. It gives you access to a wide array of baseplates. I’ve heard of people using PNL 20degree plates with their Paris Savants and other Paris trucks so they can have as much stability as possible in the back. In fact, Morgan Owens uses a custom slalom style downhill board with a 20degree PNL plate in the back, paired with Savant hangers. I personally use a 28degree and 35degree Randal baseplate with my Caliber trucks for more stability and confidence at speed. I’ve hit 80kmh regularly and felt confident and stable. Check out the 35 degree trucks on Amazon. You’ll have to buy the whole truck to get the plate but it is worth it. You can also buy the 35* baseplate from the Randal website and the 28* baseplate from Sickboards. Obviously, you don’t have to do any of the above, but knowing all this gives you options. You can really make the most out of your current truck this way. It’s also super helpful if you’re broke or frugal and don’t want to have to buy new trucks so you can have access to narrower hangers or a lower/higher angle baseplate. 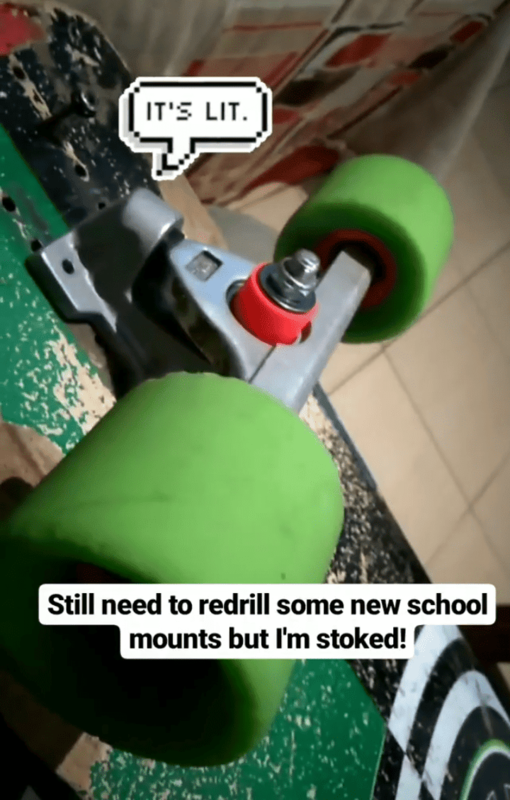 I also recommend going on to facebook groups like #WhatGearShouldIBuy or Reddit/Longboarding and posting a question if you want to know which baseplates your trucks are compatible with,they are also good places to ask questions you can’t find an answer to.